BOSTON & PLEASANTON, Calif.--(BUSINESS WIRE)-- One of the largest, most in-depth surveys of clinical data management professionals shows that the time it takes companies to design and release clinical study databases is having a negative impact on conducting and completing trials. According to the 2017 eClinical Landscape Study from Tufts Center for the Study of Drug Development, it takes companies an average of 68 days to build and release a clinical study database. Delays in releasing the study database are associated with an increase of nearly a month downstream for other data management processes such as patient data entry and time to lock the database at the end of the study. Respondents that deliver the database after first patient, first visit (FPFV), take nearly twice as long to enter patient data throughout the study and about 75% longer to lock the study database when compared to those that deliver the final database before FPFV. EDC is the most widely adopted clinical application, used by all respondents (100%), followed by randomization and trial supply management (77%), electronic master file (70%), and safety (70%) systems. A majority (58%) of respondents use either Medidata Rave or Oracle Inform as their primary EDC system. When asked about the type of data managed in their EDC, all (100%) CROs and sponsors cite electronic case report form (eCRF) data, followed by local lab and quality of life data (60% each). However, respondents say eCRF data is the highest volume of data they manage in their EDC system (at an average of 78% of the total data managed). The next highest data volumes reported are central lab data and local lab data at 5% each. Remaining data types reported are each 4% or less. This demonstrates the need for processes and systems to support the industry’s vision to have complete study data in their EDC. More than three-quarters (77%) say they have issues loading data into their EDC application and most (66%) say EDC system or integration issues are the primary reasons they are unable to load study data. The survey finds several common causes for clinical database build delays. Protocol changes is cited most by 45% of respondents, underscoring the challenge data management professionals have in dealing with changes as they are finalizing the clinical trial database for the start of the trial. This highlights the need to optimize the database design process with standards and systems that support more flexible design and rapid development. 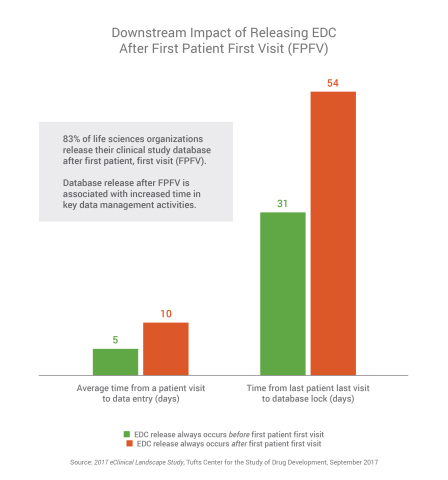 Initial database delays also have significant downstream impacts on the time it takes sites to enter patient data in the EDC throughout the trial, as well as the final lock of the database once the study is complete. It takes on average five days from patient visit to when the data is entered into the EDC for companies that release the database before FPFV. When the database is released after FPFV, data entry time doubles to 10 days. The impact of database build delays is even greater by the time companies get to database lock. Those who always release the database before FPFV get to database lock in an average of 31 days. Those who never release the database before FPFV take more than three weeks longer (54 days) to lock the database. Sponsors take roughly 40% longer than CROs to build the database (73 vs. 53 days) and to get to database lock (39 vs. 28 days). Also, those using the two leading EDC systems report roughly 20% longer data cycle times (123 days) than those using other EDC systems (99 days), which includes time for database build (75 vs. 60 days), patient data entry (9 vs. 7 days), and database lock (39 vs. 32 days). The 2017 eClinical Landscape Study: Assessing Data Management Practices, Performance, and Challenges from Tufts Center for the Study of Drug Development, sponsored by Veeva Systems (NYSE: VEEV), reviews the state of data management in life sciences with an in-depth look at the insights and opinions of clinical data management professionals at more than 250 companies, including sponsors and CROs, with an average of 17 years of experience in clinical data management. Download the report at veeva.com/EDCSurvey. To learn more about the findings, see the presentation from Ken Getz, research associate professor and director at the Tufts Center for the Study of Drug Development, and Richard Young, vice president of Veeva Vault EDC, at the SCDM 2017 Annual Conference on Monday, Sept. 25 at 3:00 p.m. in the exhibit hall. The Tufts Center for the Study of Drug Development at Tufts University provides strategic information to help drug developers, regulators, and policy makers improve the quality and efficiency of pharmaceutical development, review, and utilization. Tufts CSDD, based in Boston, conducts a wide range of in-depth analyses on pharmaceutical issues and hosts symposia, workshops, and public forums, and publishes Tufts CSDD Impact Reports, a bi-monthly newsletter providing analysis and insight into critical drug development issues. For more information, visit csdd.tufts.edu. Veeva Systems Inc. is a leader in cloud-based software for the global life sciences industry. Committed to innovation, product excellence, and customer success, Veeva has more than 550 customers, ranging from the world's largest pharmaceutical companies to emerging biotechs. Veeva is headquartered in the San Francisco Bay Area, with offices in Europe, Asia, and Latin America. For more information, visit veeva.com. The 2017 eClinical Landscape Study examines the state of clinical data management in the life sciences industry. The goal of the research is to understand current clinical data management practices and assess the performance and challenges of electronic data capture (EDC) systems. One of the largest, most in-depth clinical data management studies to date, this research captures the insights and opinions of 250 clinical data management professionals, including sponsors and CROs with an average of 17 years of clinical data management experience. EDC applications are the most prevalent clinical applications, used by all (100%) respondents, followed by randomization and trial supply management (77%), safety/pharmacovigilance (70%), electronic trial master file (eTMF) (70%), and clinical trial management (CTMS) (61%) systems. A majority (58%) of respondents use Medidata Rave or Oracle Inform as their primary EDC application. No other application was used by more than 6% of organizations. While all respondents use an EDC system, roughly one-third (32%) use paper case report forms (CRFs), indicating these organizations still rely on manual processes to manage data during their clinical trials. Organizations say they manage a wide range of data types in their primary EDC system including eCRF (100%), local lab (60%), quality of life (60%), central lab (57%), and ePRO (34%) data. Only 10% of companies have genomic data or mobile health data in their EDC. While companies have variety of data types in their EDC, respondents say the largest proportion of the data in their EDC system is eCRF data (estimated at 78% of total data managed). All other data types were each estimated at 5% or less of the total volume of data in the EDC, including local lab data (5%), central lab data (5%), quality of life data (4%), and ePRO data (3%). Genomic data and mobile health data make up the smallest portion of data in EDC systems at 0.4% and 0.3% respectively. On average, it takes 68 days to build and release a study database, 8 days from patient visit to enter data in the EDC system throughout the study, and 36 days from the study’s last patient visit to database lock. Sponsors, as well as those using the two most prevalent EDC applications (Medidata Rave and Oracle Inform), report longer times to build and release the study database and to lock the database after last patient, last visit. The up-front time it takes to build and release the clinical database has potentially significant impacts on downstream processes, including time to enter patient data in the EDC throughout the study and time to final database lock after last patient, last visit. It takes on average five days from patient visit to when the data is entered into the EDC for companies that release the database before FPFV, and database lock time is 31 days. It takes on average 10 days from patient visit to when the data is entered into the EDC for companies that release the database after FPFV, and database lock time is 54 days. Nearly one-third (32%) of sponsors “often” or “always” release their EDC after FPFV has occurred, compared to 20% of CROs. One-third (36%) of those using the two most prevalent EDC applications “often” or “always” release their EDC after FPFV has occurred, compared to 22% of those using other EDC applications. The most common cause for database build delays is protocol changes (45%), followed by user acceptance testing (17%), and database design functionality (15%). Database build delays due to protocol changes are higher among CROs (52%) than sponsors (44%). Whereas database build delays due to design functionality are lower among CROs (7%) than sponsors (18%). Database build delays due to database design functionality is associated with significantly longer time to lock the database after last, patient last visit (50 days vs. the 36-day average). Three-quarters of respondents (77%) have issues that prevent them from loading data into their primary EDC system. Most (66%) cite EDC system issues or integration issues as the top challenges that prevent them from loading data.